She’d watched me with her head down, busy, while I wrote a colourful invitation to a shared meal on the whiteboard of the palliative care ward. I had been hearing about her and her son who she has been caring for around the clock for 16 years. I hovered a little in the corridor, offered a smile; the family in the next room had also been watching. They’d been sitting by the bed of their older sister for weeks, with little to do but hold vigil. They smiled back an invitation to enter. “We’ve already made a plan!” I was told. “I will stay with Joan and my sister will go home and prepare a meal to bring. What a great idea. If we are still here.” Because there is always that on the ward. Joan lay in her bed, sleeping, her dry mouth wide open in her thin face, lined with the traces of what can only have been a full life. Every life lived, no matter how long, has been full. The mother in the room next door remained busy. There are many ways to hold vigil. It was not my time to enter. The following week, I’m back on the ward, armed with printed invitations. I speak with the ward staff about which rooms to leave in peace that day and begin to quietly knock on the other doors. There are so many people to enter a hospital room on any given day; the doctors and nurses and allied staff, the social worker, physio and occupational therapists, cleaners and bringers of food, volunteers offering song and distraction, company and sometimes if you’re lucky, beer and wine, visitors from far and wide. Every time I knock, I note, I am still welcomed as a guest, even if with weary anticipation. “What IS a community development worker?” But mostly they get it. We all know what community is. Even the junior medical officer had said to me “you should be here every day!” As an artist on the ward, and now as a community development worker I have never felt in the way of what we can be led to believe is the most important work of the ward, the medical team. Important as it is, absolutely crucial to why anyone is in a hospital bed, it plays only one part of any persons web of care. 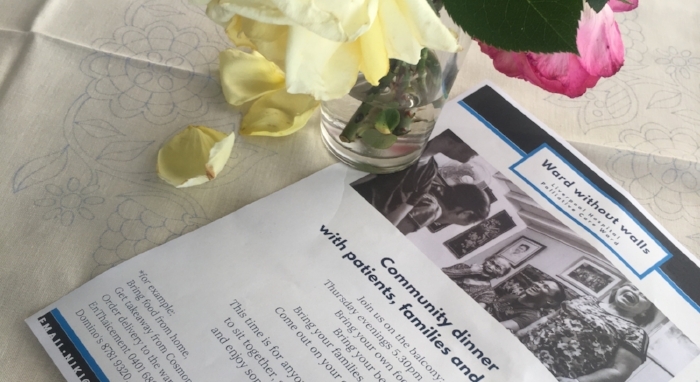 Community dinner for patients, families and friends. Come out on your own and join us! and enjoy some of the simple gifts of life. Pretty simple. No matter our age or culture or financial status, most of us know the simple pleasure of food and company, even those of us who may not be able to eat or have lost appetite or taste, we all know the benefit of being together, even if it is only what we have yearned for. “I’m lonely when I eat my dinner here at night” are the first words Barb said to me when I entered their hospital room that day and invited her and her son to join us for dinner; “I’d love to come. All week I have been thinking about it and I want to order some pizza for us all to share”. She had just made herself a coffee and was stirring it as she spoke. The tables beside her were laden with the things of life we gather around us as we go about our days, she’d made a kind of home away from home. Gary was awake and in his wheelchair. Gary’s carer was also in the room and they told me about the 9 years they had known each other as carers for Gary, both mother and support worker. They told me of love and humour and compassion, what it’s like when lives connect to care for someone with such profound disabilities. They told me about Gary and how he communicates, how he loves music. I learnt a little more about something beyond my realm of experience. We didn’t talk about dying or being on the palliative care ward, we spoke about his life, their lives entwined, right here and now. Later, when dinner time arrived and we gathered on the balcony together with other guests on the ward, we continued the conversations. There was much talk of our gardens, roses blooming soothing the heart of one with a recent loss, vegetables grown in a childhood village, food foraged from the land. One man grew vegetables for his family and was hoping to get home again to his garden soon. We each ate our own meals, rice paper rolls bought from the café downstairs, bolognaise from last night’s tea, soup and salad brought on a tray with custard and fruit in a cup from the hospital kitchen. Pizza. We decided that the tomato was the universal vegetable, as it was used in many cultures in so many different ways. We all agreed the homegrown ones were the best, and wondered if they grew in the desert.